Nature play is not just children playing in nature but children engaging with nature. Urbanization, changing lifestyles and proliferation of technology are dramatically impacting how children play, learn and grow. Opportunities for unstructured free play in living environments have become scarce for many families. Being immersed in flora and fauna instills a sense of beauty and tranquility while igniting curiosity and exploration. When natural systems are incorporated into design, children connect to different types of ecosystems—promoting play, learning and exploration. Evidence is growing that unstructured free play in living environments offers tremendous benefits to the collective development of children. Nature is important to children’s development in every major way— intellectually, emotionally, socially, spiritually and physically. Designing for play doesn’t mean simply creating a playground specifically zoned for children’s play, but instead provides an integrated system of outdoor spaces that are safe, sustainable and stimulating for all ages and mobility levels. An inclusive design encompasses children’s needs through enclosure, signage, seating, shade, transportation, circulation, ramps, transfer pads, and cozy and quiet spaces. A well-planned inclusive playground will not only entice kids back to outdoor play, but will also allow children of all abilities to develop the strong sensory and motor systems that are so vital for their futures. The Rochester ChildFirst Network Playground Master Plan (above) emphasizes inclusive play, exploration, and a diversity of activity opportunities for children of all ages and mobility levels. 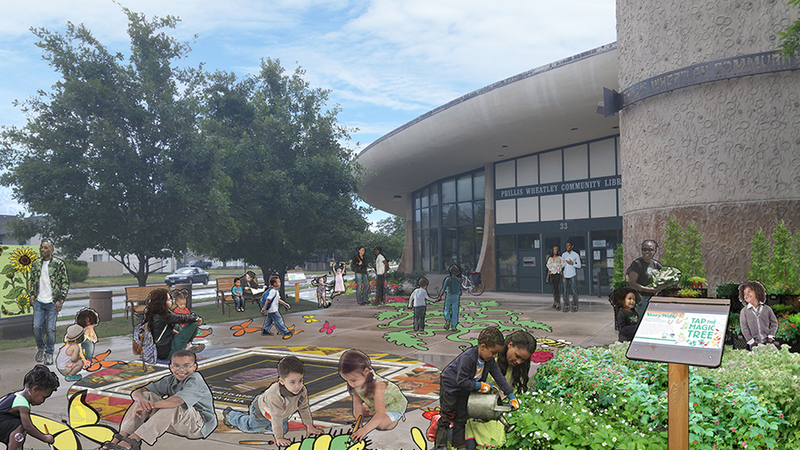 Our rendering for an interactive Story Walk and playful sidewalks at Phillis Wheatley Community Library (above). Healthi Kids Coalition of Finger Lakes Health Systems Agency will partner with the Rochester Public Library and City of Rochester to create the Story Walk. 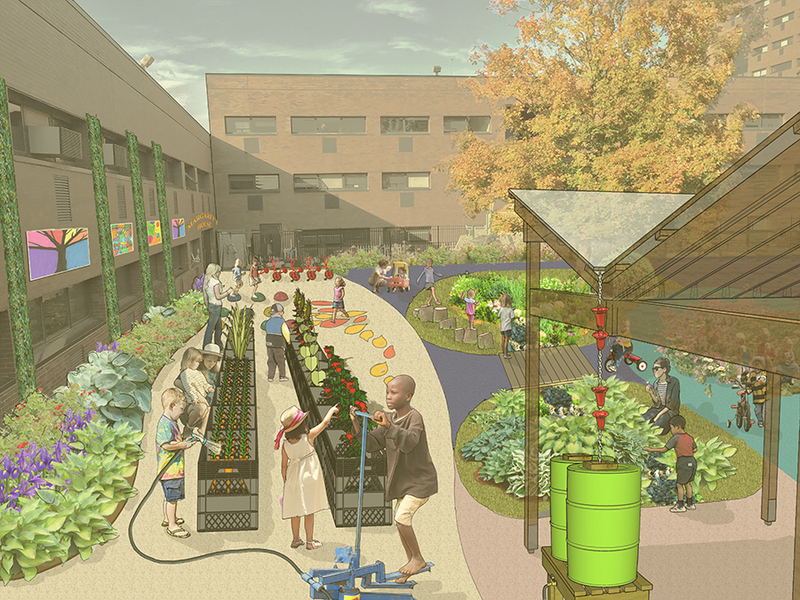 B&L’s vision for the Margaret’s House playscape on the RIT campus (above). 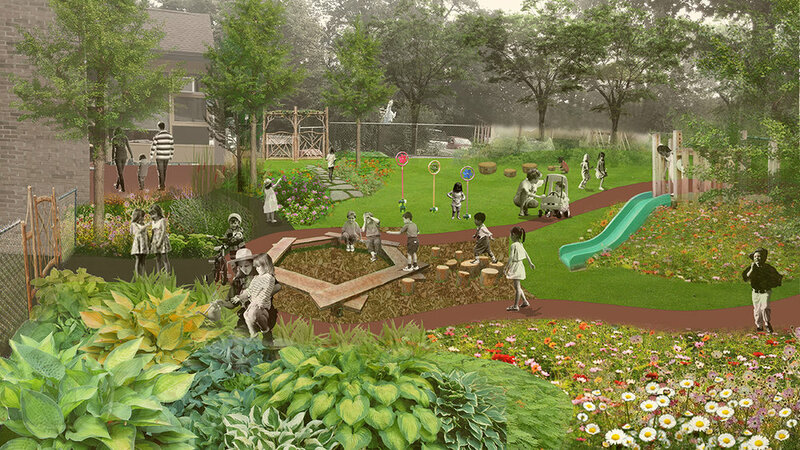 This landscape for play will transform an outdated playground and is designed to encourage creative and imaginative play where children are free to explore the natural world. The Regional Green Infrastructure Showcase at the Rochester Museum & Science Center (RMSC) embeds a natural systems approach to storm water management within an attractive and sustainable urban public space. Vegetative Buffers: Layers of garden types within the play gardens can break up space and provide buffers from adjacent properties. Flower gardens: promote sensory interaction and attract bugs, birds and butterflies. Stormwater Management and Infiltration Gardens: Swales and other stormwater features can act as channels to move, capture and infiltrate stormwater run-off. Willow Huts and Tunnels: Living willow structures are safe, shaded, sense-stimulating zones where children can relax or enjoy imaginative play in direct contact with nature. Observing the lifecycle of willow, and the wildlife it attracts, heartens a kinship with the natural environment. Tricycle and Walking Loop: A Trike Track can serve as an ADA compliant unifying element. Smooth, consistent rubber is ideal for tricycle traffic and walking, allowing children of all ages and abilities to develop their motor coordination, endurance, and self-confidence. Pipe Bridge Tunnel: Children can crawl through a prefabricated pipe installed as a tunnel, or it can be used as an obstacle along the tricycle track that children need to peddle up and over, promoting body awareness, physical strength and motor planning skills. Edible Gardens: Using stacks of re-purposed milk crates, vegetables, herbs and small fruits can be grown and harvested on site. Stormwater Management through Rainwater Harvest: A rainwater harvest pavilion provides shade and captures rainwater. Rainwater can be harvested through a series of rain barrels connected to a self-powered bicycle pump that moves water from the rain barrels to the edible gardens. Terrain Slides: With some minor earthwork, existing play structure slides can be re-purposed as terrain slides. Re-naturalized Areas: Incorporating trees, shrubs, perennials and grasses common to local wetlands bring the wetland ecology into the play gardens, allowing for educational opportunities of the local ecosystem. Nature play is not a new concept, particularly for those who live in rural areas, but urban and suburban communities and child care providers can embrace the overwhelmingly positive benefits that nature provides to all aspects of a child’s development. Incorporating simple elements to semi-naturalize areas or capitalize on existing naturalized areas provide opportunities for children to splash in puddles, collect flowers, nuts and berries, hide in tall grass, roll down a hill, and ultimately, grow up healthy and strong with a sense of stewardship for nature. Kellert, S.R. (2005). Building for life: designing and understanding the human-nature connection. Bell, A.C., and Dyment J.E. (2006). Grounds for movement: green school grounds as sites for promoting physical activity. Burdette, H.L. and Whitaker, R.C. (2005). Resurrecting free play in young children: Looking beyond fitness and fatness to attention, affiliation, and affect. Archives of Pediatric and Adolescent Medicine, 159, 46-50. Wells, N.M. (2000). At home with nature. Effects of “greenness” on children’s cognitive functioning. Environment and Behavior, 33, 775-795. Taylor, A.F., Kuo, F.E., and Sullivan, W.C. (2001). Coping with ADD: The surprising connection to green play settings. Environment and Behavior, 33, 54-77. Drew, W. (2007, June/July). Make way for play. Scholastic Parent and Child, 40-47.